When searching for a photo for our latest Foundation overview brochure, we decided to call on one of the most talented photographers we know: Jake Stangel. Jake also happened to be a fellow Bike & Builder and a good friend of Christina’s, and so his portfolio of active lifestyle photography provided a great spot for us to find the perfect photo. 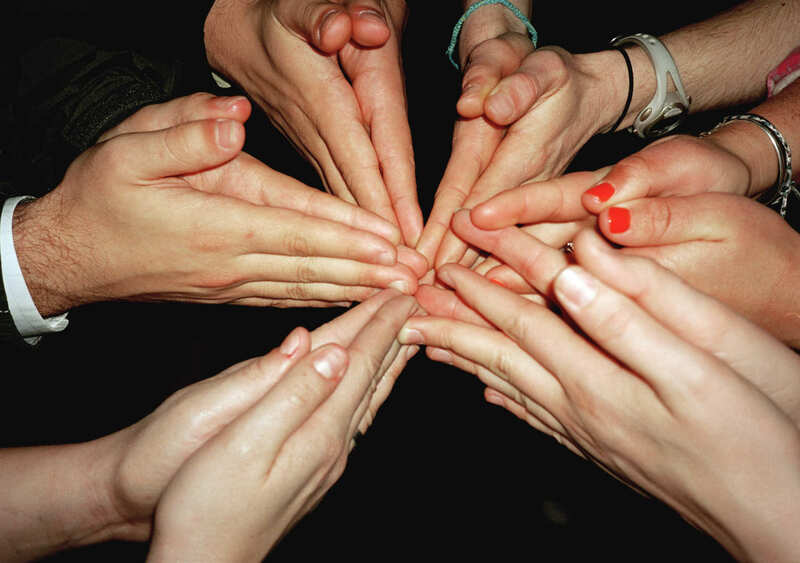 When Caroline (our President) selected a photo of six people with their hands pointed together, it clicked. It represented connection, youth, and fun. Best of all, it wasn’t stock photography—it was a real photo from Jake’s daily life. Jake graciously provided us with the photo and told us that it was from a rowdy game of NINJA that he had played back in the day with a few friends. When Board member and Bike & Builder Sarah Royal took a look at the photo, she was stunned at the coincidence: Christina’s hands, covered in red-orange nail polish and squished between Sarah’s and another friend’s hands, were in the photo. Without even knowing it, Caroline and Marty had selected what they thought was a perfect photo to represent Christina—and Christina ended up actually being in the photo itself. We’re firm believers in, well, believing. While we attempt to navigate social injustices and process terrible tragedies like those that took place at the Boston Marathon, Christina’s presence turns up in the most unexpected places. It inspires us to continue her legacy and provide hope for our communities. We hope it does the same for you. Thank you to Jake for providing us with the photograph. Check out more of Jake’s amazing photography at www.jakestangel.com.